The Giver preview by Lizzie! Imagine a world without color, without hunger, and without pain. This is the futuristic world of The Giver, written by Lois Lowry. But now, this wonderful classic is brought to life on the Childsplay stage! After talking with Andres Alcala, the director, I am absolutely excited to attend this show. He told me about how he will be using technology and even how he helped develop the original play in Oregon! Using innovative technology, he will bring the audience into the world of Jonas. You might even see yourself on a screen at the beginning! There will even be an instance when a table will turn into a sled and seem to move toward the seats as a memory is recalled. To me, that sounds like the most exciting part. At the start of the tale, Jonas’ world seems perfect. There is nothing wrong with it—the weather is constant, no one is hungry, and everyone is happy with the same consistency. 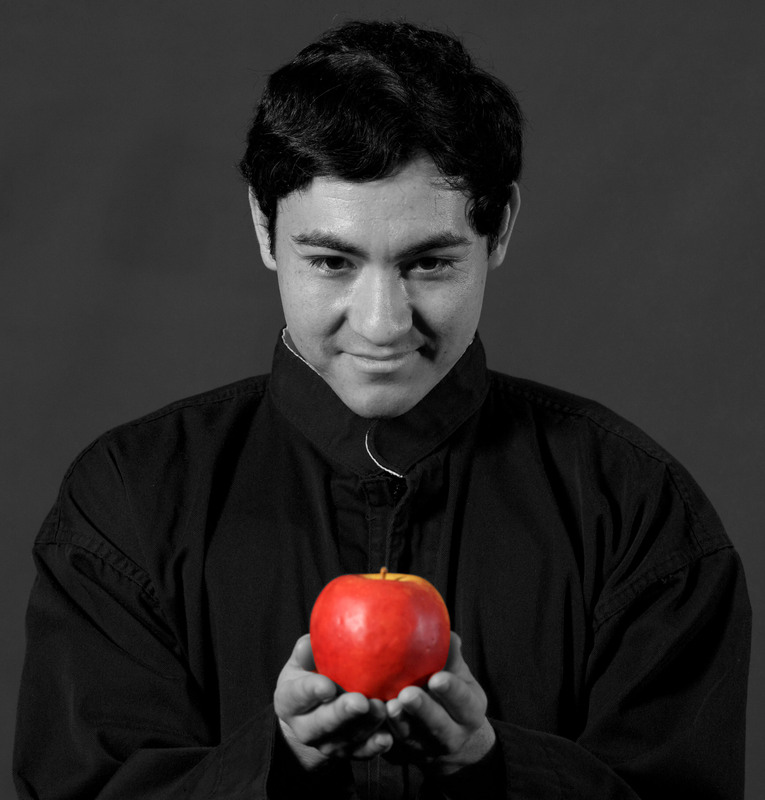 But, after he is assigned the role of the Giver’s apprentice, he learns more about the truths of his community. “As [Jonas] learns more about . . . lies and his father, his world starts crumbling around him,” says Alcala. I read the book recently, and the thought of putting it in a play is so intriguing. It almost sounds impossible, with all of the technology and differences in the time, but I bet having an excellent cast helps a lot. “I tried to get a creative group who can understand more than what’s in the script,” relates Alcala. For Jonas, he needed someone who could change emotions quickly, and that person is Adrian Hernandez, who stars as Jonas. Also featuring Dwayne Hartford as the Giver, Kaleena Newman as Rosemary/Fiona, Michelle Cunneen as Lily, Debra K. Stevens as Mother, and Louis Farber as Father, this is sure to be a hit. Alcala hopes that the audience will walk away with the feeling that they have the ability of freedom, choice, and real love. As children, having the ability to know and choose what we want to be when we grow up is very different than Jonas’ situation. While we can choose, Jonas and kids his age are watched their whole life to see what job would fit them best. The feeling and mood of this play is very far away and vague. “I try to make it not too cartoony and not too real, but more abstract, like it’s in the distance,” says Alcala. When it all adds up, this is a sure recipe for a successful, meaningful play that can sum up the true meaning of love, family, choice, and standing up for oneself. There is no doubt that everyone, young and old will enjoy it—I can’t wait to see the surprises this has in store! Just come on out to Tempe Center for the Arts! No, wait—just come on out . . . to Jonas’ world! Previous Alex reviews ROCK THE PRESIDENTS! Next Rock Paper Scissors review by Bryn! Great article, very well-written! Makes me want to go see the play! Very impressive writing, esp. since this is your first “Kid Reporter” review. Looking forward to many more in the future Lizzie! Loved reading this book years ago and I’m sure it will make a very interesting play. Great preview of the play! WOW Lizzie! That was amazing!! I think you did an incredible job on this review! I hope you do well on your other “Kid Reporter” reviews! Now I want to see the play!! !